For the desktop presence framework, see Galago (software). For the animated series, see The Bush Baby. For the Swedish magazine, see Galago (magazine). Galagos /ɡəˈleɪɡoʊz/, also known as bushbabies, bush babies, or nagapies (meaning "little night monkeys" in Afrikaans), are small, nocturnal primates native to continental Africa, and make up the family Galagidae (also sometimes called Galagonidae). They are sometimes included as a subfamily within the Lorisidae or Loridae. According to some accounts, the name "bushbaby" comes from either the animal's cries or its appearance. The South African name nagapie is because they are almost exclusively seen at night, while the Ghanaian name " aposor" is given to them because of their firm grip on branches. 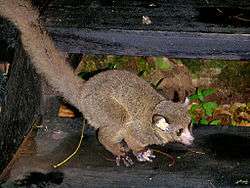 In both variety and abundance, the bushbabies are the most successful primitive primates in Africa, according to the African Wildlife Foundation. After a gestation period of 110–133 days, young galagos are born with half-closed eyes and are initially unable to move about independently. After a few (6–8) days, the mother carries the infant in her mouth, and places it on branches while feeding. Females may have singles, twins, or triplets, and may become very aggressive. Each newborn weighs less than half an ounce. For the first three days, the infant is kept in constant contact with the mother. The young are fed by the mother for six weeks and can feed themselves at two months. The young grow rapidly, often causing the mother to walk awkwardly as she transports them. Females maintain a territory, but share them with their offspring. Males leave their mothers' territories after puberty, but females remain, forming social groups consisting of closely related females and their young. Adult males maintain separate territories, which overlap with those of the female social groups; generally, one adult male mates with all the females in an area. Males that have not established such territories sometimes form small bachelor groups. While keeping them as pets is not advised (like many other nonhuman primates, they are considered likely sources of diseases that can cross species barriers) it is certainly done. Equally, they are highly likely to attract attention from customs officials on importation into many countries. Reports from veterinary and zoological sources indicate captive lifetimes of 12.0 to 16.5 years, suggesting a natural lifetime over a decade. Galagos communicate both by calling to each other, and by marking their paths with urine. By following the scent of urine, they can land on exactly the same branch every time. All species of galago produce species-specific 'loud calls' or 'advertisement calls'. These calls have multiple different functions. One function is long-distance identification and differentiation of individual species, and scientists are now able to recognize all known galago species by their 'loud calls'. At the end of the night, group members use a special rallying call and gather to sleep in a nest made of leaves, a group of branches, or a hole in a tree. Galagos have remarkable jumping abilities. The highest reliably reported jump for a galago is 2.25 m. According to a study published by the Royal Society, given the body mass of each animal and the fact that the leg muscles amount to about 25% of this, galago's jumping muscles should perform six to nine times better than those of a frog. This is thought to be due to elastic energy storage in tendons of the lower leg, allowing far greater jumps than would otherwise be possible for an animal of their size. In mid-flight, they tuck their arms and legs close to the body; they are then brought out at the last second to grab the branch. In a series of leaps, a galago can cover ten yards in mere seconds. The tail, which is longer than the length of the head and body combined, assists the powerful leg muscles in powering the jumps. They may also hop like a kangaroo or simply run/walk on four legs. Such strong, complicated, and coordinated movements are due to the rostral half of the posterior parietal cortex that is linked to the motor, premotor, and visuomotor areas of the frontal cortex. Generally, the social structure of the galago has components of both social life and solitary life. This can be seen in their play. They swing off branches or climb high and throw things. Social play includes play fights, play grooming, and following-play. 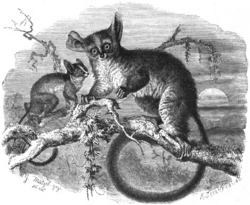 When following-play, two galagos jump sporadically and chase each other through the trees. The older galagos in a group prefer to rest alone, while younger ones are in constant contact with one another. This is observed in the Galago garnetti species. Mothers often leave infants alone for long periods of time and do not attempt to stop infants from leaving them. On the opposite hand, the offspring tries to stay close to the mother and initiates actions of maintaining close proximity and activating social interactions with the mother. Grooming is a very important part of galago daily life. They often autogroom before, during, and after rest. Social grooming is performed more often by males in the group. Females often reject the attempts made by the males to groom them. A low-coverage genomic sequence of the northern greater galago, O. garnettii, is in progress. As it is a 'primitive' primate, the sequence will be particularly useful in bridging the sequences of higher primates (macaque, chimpanzee, human) to close nonprimates, such as rodents. The two-time planned coverage will not be sufficient to create a full genome assembly, but will provide comparative data across most of the human assembly. 1 2 Groves, C.P. (2005). "FAMILY Galagidae". In Wilson, D.E. ; Reeder, D.M. Mammal Species of the World: A Taxonomic and Geographic Reference (3rd ed.). Baltimore: Johns Hopkins University Press. pp. 123–127. OCLC 62265494. ISBN 0-801-88221-4. ↑ "African Wildlife Foundation". Awf.org. 2012-06-20. Retrieved 2012-07-26. 1 2 3 4 5 "BUSH BABY". Retrieved 2012-07-26. 1 2 Charles-Dominique, Pierre (1984). Macdonald, D., ed. The Encyclopedia of Mammals. New York: Facts on File. pp. 332–337. ISBN 0-87196-871-1. ↑ Bearder, Simon K.; Butynski, Thomas M.; de Yong, Yvonne A. (2013). "Vocal Profiles for the Galagos: A Tool for Identification". Journal of Primate Conservation. 27: 75. doi:10.1896/052.027.0102. 1 2 Aerts, Peter (29 October 1998). "Vertical jumping in Galago senegalensis: the quest for an obligate mechanical power amplifier". Philos Trans R Soc Lond B Biol Sci. 353 (1375): 1607–1620. doi:10.1098/rstb.1998.0313. ↑ Stepniewska, Iwona; Fang, Pei-Chun; Kaas, Jon H. (2005). "Microstimulation reveals specialized subregions for different complex movements in posterior parietal cortex of prosimian galagos". Proceedings of the National Academy of Sciences of the United States of America. 102: 4878–4883. doi:10.1073/pnas.0501048102. PMC 555725 . PMID 15772167. 1 2 Witt, Cornelia (September 1982). "Preliminary observations on the social behaviour of the greater galago, Galago agisymbanus Coquerel, 1859, in captivity". Anthropologischer Anzeiger: 193–203. ↑ Fleagle, John G. (1999). Primate adaptation and evolution. Academic Press. p. 114. ISBN 978-0-12-260341-9. Retrieved 10 July 2011. Wikimedia Commons has media related to Galagidae.